Good morning from the sumptuous study of Dan and Trish Adams in Edina, a suburb of Minneapolis. It is 06.20 and the rhythm of waking and preparing for another 30 mile day has not left me on the first of our two rest days before the next push south. I slept poorly, my mind unable to switch off from the enormity of the achievement of simply reaching here after all the planning, as well as what this weekend holds. However, that will need to be the subject of tomorrow’s update where I can relate what actually happened as opposed to what I hope may happen whilst in what feels very much like my home town in the mid-west. Yesterday arrived with a bang. Biblical claps of thunder accompanying Hollywood style lightning from 05.00. We were all shaken awake by the storm’s power and peered nervously into the gloom to see the rain hammering down. 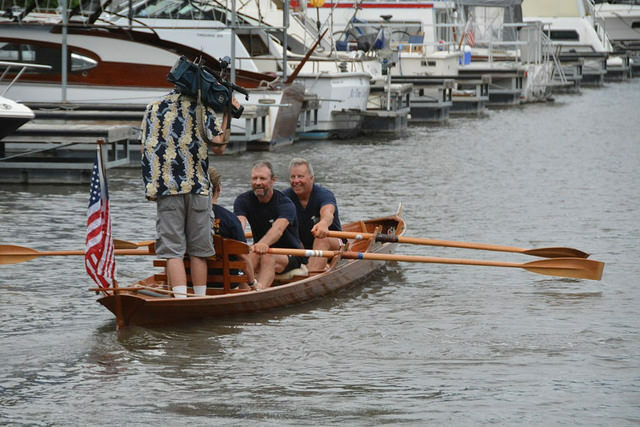 We delayed our start by an hour to let it clear, which it duly did, but to give you a clue, the two and a half hours of rain deposited two feet of water in the skiff on the top of our trailer….. I was tired from the previous days headwind and was worried that I might be in for a sub-par day, the forecast being for another day of headwind. But the mantra of the project was apt “I have the right to go as slowly as I want, but not the right to stop”. 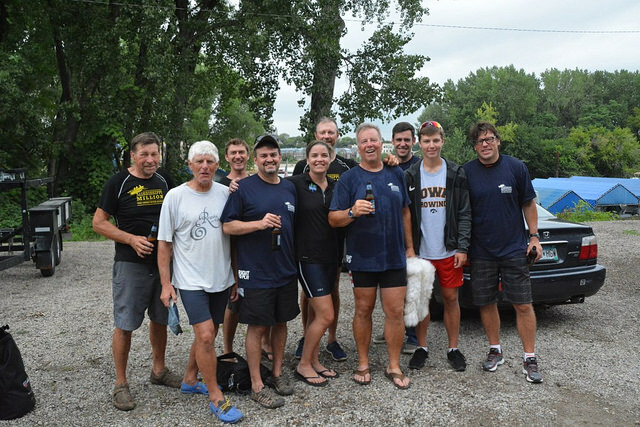 The first five minutes were slow, but with Johann steering for the first two hours and Jerry Dale rowing, we soon began to find a pace that surprised me and I shook off my doubts and leaned into the oars with unexpected relish. What a day it turned out to be. 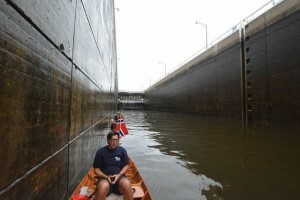 The first 12 miles flew by and we reached the upper St Anthony’s Falls lock quickly. Now let me tell you, having travelled through locks hundreds of times on the Thames, nothing prepares you for the sheer scale of these Mississippi locks. The size of a small football pitch, accompanied by mechanical gear of gigantic proportions and surrounded by roaring water falls (imagine a smaller Niagara). So large, they have their own visitor centres and guided tours, not something you might find in Sunbury on Thames! Three of these beauties marked our day. Johann climbed back into the bow seat and, inspired by his lessons the day before, found his form and rhythm and we flew over the last ten miles to our end point in St Paul. We were greeted by a small but perfectly formed group of friends and, as ever, my father in law Harry (who has become a bit of a mascot for the team). We were simply thrilled to have reached our goal and joyously drained the ice cold Sam Adams that Dan had thoughtfully brought. A quick half our with the first TV crews and we were loaded and dispersing to our various temporary lodgings. Tonight is the first of our events held in support of the project and, most importantly, it marks the arrival of my wife Julie. A big couple of days ahead and now very much in keeping with our daily pattern, I am looking forward to the first of my two breakfasts! Hi John. Just caught up with all your blogs, really good reading, so thank you for the effort! Been a busy 3 weeks, and intermittent internet for the last 2, hence the delay, but you have been in all our thoughts, wondering on your progress. Despite the hard work, it all sounds to be going well and being enjoyed by all. BTW, bald eagles, we were told (in Colorado), were originally called piebald eagles because of the 2 colours, although Singapore Bird Park think it’s because the white make them look bald from a distance (we didn’t disabuse them of the notion). Have no idea about male/females! Josh says hi to Charlie. Thinking of you all. Good luck. I’m very inspired by what you are doing. 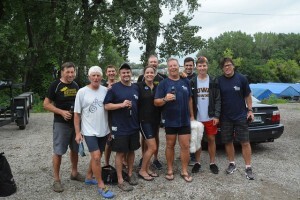 I recently completed a learn to row class in Moline Illinois and am very enamored of the sport. Hope to see you as you pass. Again, good luck. Congrats on reaching St Paul John! 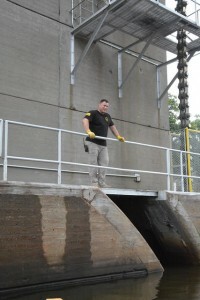 Love the pics of the locks. I do hope that the parties were a blast???!!! Loving the blog and it does seem like you will have enough stories to tell Paddy?! Lucy, Matt and I are back in London now but thought of you passing through the Twin Cities just as we were flying out of MSP. Wish we could have joined you on the 22nd but we were there in spirit. Lucy has just sent out follow up emails to present and potential donors to Right to Play. The two days with you, Paddy and the crew were among the highlights of the summer. May the wind be at your back!